A band consisting of a progressive metal band´s vocalist, a renowned blues rock guitarist and a former drummer of a latter day American progressive rock band, would that suite anyone? 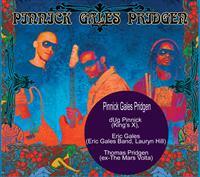 Why not, as it is dUg Pinnick, Eric Gales and Thomas Pridgen who are at work. All members seem to have had their say in creating this album, and I very much like their individual styles. The info sheet promises a mix of KINGS X, THE ERIC GALES BAND and the MARS VOLTA, serving as a bas to attract fans of as diverse acts as CREAM, STEVIE RAY VAUGHN and TOOL! Opener “Collateral Damage” is seventies groovy blues which is intriguing and has a distinct black sound to it, but it still only serves as a teaser of things to come. The sheer beatof “Angels and Aliens” could keep a boat steaming over the Atlantic! I ike the guitar effect, I love the refrain and the arrangements are highly enjoyable. But “For Jasmine” feels like an underdeveloped idea of a standard jam, and “Wishing Well” is only a NIRVANA variety, albeit a fine and unique take. The surprises have only begun though. “Lascivious” is a bang ob black blues with a straightforward refrain and a pinch of stoner added. The slightly Indian touch added to “Black Jeans” moves into a pretty dirty blues that increases in intensity as the song progresses. The bass line of “Been So High (The Only Place to Go Is Down)” has a seventies junkie theme and a formidable bass line. All songs are like individuals, perhaps with the exception of the JIMI HENDRIX cover “Sunshine of your Love” – which has all the black features you can ask for. It is demanding for ach track to stand out on this disc, and few does, but those are true “black diamonds”. “Angels and Aliens”, the soul-infused seventies blues of “Hang On, Big Brother” and the lighter blues variety of the very groovy and catchy “The Greatest Love”. I could go on all day. They even surprise me with the closing track “Frightening”, as it has a pulse! This is no fuss, this is a masterpiece.